Here at William Bruno Plastic Surgery, we believe that the best patient is an informed one. Unfortunately, in today’s media there is a constant bombardment of misinformation about plastic surgery. From tabloids highlighting botched celebrity procedures to falsehoods on the internet, it can be difficult to find a source of unbiased and useful information. That is why Dr. Bruno wrote his new book, “The Modern Woman’s Guide to Choosing a Plastic Surgeon: Breast, Body, Buttocks”. He wants his patients to have a helpful guide when exploring the often confusing world of plastic surgery, so you can take your next step with confidence. For Dr. Bruno, the patient always comes first. After you read the book, if you decide that plastic surgery is not for you that is perfectly fine. If you decide you want to dive in breast, body, and buttocks first, that is great too! Dr. Bruno has been fascinated by medicine his entire life, idolizing doctors and artists from a young age. After years of working as a surgeon, he discovered plastic surgery and was dazzled by the potential of it. He believes that plastic surgery is the place where art and medicine meet, and that with the right procedures, he can help a person discover their best self. Working in his private practice in the Beverly Hills area since 2004, he has become a leading expert in the field. 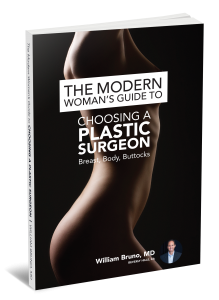 To guarantee that you have all of the necessary information to make an informed decision about whether plastic surgery is right for you, we are offering you a complimentary copy of “The Modern Woman’s Guide to Choosing a Plastic Surgeon: Breast, Body, Buttocks”. All you have to do is call our office at 310.461.3855 and schedule your consultation! If you would like to purchase a copy from Amazon, please click here. We hope that this book will empower you with the knowledge necessary to ask the right questions, decide on the right procedures, and to find the plastic surgeon who is right for you!